Through Grace Kids clubs, your kids learn how to involve, invite, interact with, worship and share Jesus through their creativity and passions. Our next round of clubs will meet alongside Worship & Prayer Nights from April 11 - May 9. 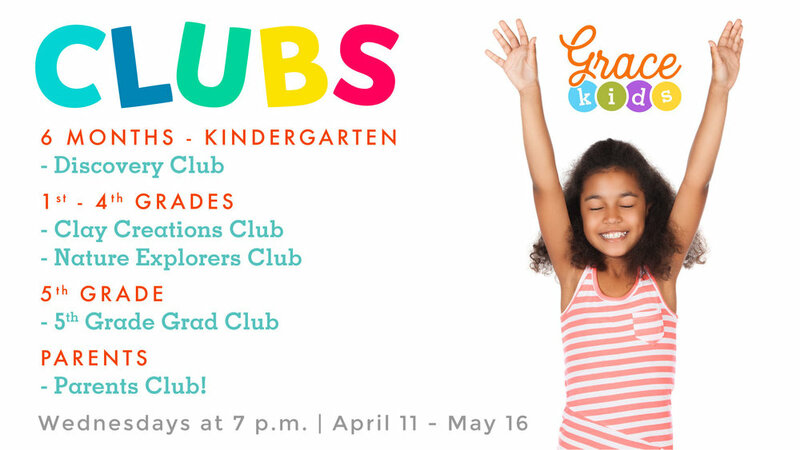 Preschoolers (6 months to Kindergarten) will join Discovery Club, grade schoolers (1st-4th grades) may choose between Clay Creations Club and Nature Explorers Club and 5th graders will join 5th Grade Grad Club to prepare them to graduate to KEEP IT REAL Youth on May 23! For the first time, we're excited to offer Grace Kids Parents Club! Parents are welcome to meet in the Big Room for coffee, dessert, connection and community. Clubs meet on Wednesdays at 7 p.m. Click below to register. Newer PostExalt the Word this Sunday!